The ride to the Timmelsjoch (Passo di Rombo in Italian) from St. Leonhard (San Leonardo) is very interesting, especially because of the large number of elevation meters (1805). This climb is standing high on the ranking list of the hardest climbs of this website in the Italian Alps (fourth in 2017). Due to the large elevation range, there is a big difference between the beginning in warm and cozy St. Leonard (671 m) and the end in the rugged alpine landscape at the pass (2474 m). 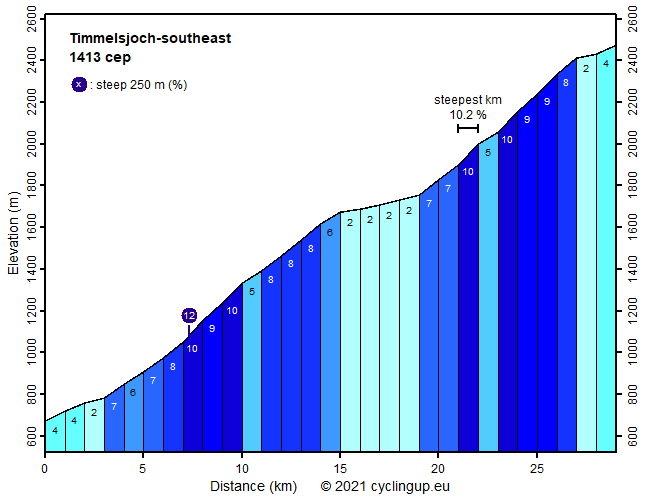 Also interesting is the profile of the 29 kilometer long climb. The first three kilometers (2-7%) are easy. Then the road gets somewhat steeper and when, after six kilometers of cycling, the road turns north at Moos im Passeier, a more than eight kilometers long, quite steep (mostly 8-10%) section follows. After that one can recover during the next almost five kilometers, which are nearly horizontal (1-4%). This also gives the opportunity to mentally prepare for the second long (seven kilometers) and steep section. That section starts at the Gasthof Schönau with 6-8% and becomes harder after the inn Hochfirst (mostly 8-10%). Nine serpentines provide variety. At the moment you start to worry that this steepness will continue up to the pass, the road dives into a 600 meter long tunnel and the real hard work is done. The remaining more than two kilometers are easy (2-6%).